These two necklaces deserve a Madlib. Remember those? A (type of animal) ate a (type of performer who wears a sparkly costume) and then (expression for vomited). Should we make it a contest? Give me your best responses and I'll pick a winner for a prize. or, alternately, (expression for evacuated its bowels). Excellent Madlib, BTW. If I saw those laying on the carpet I would hesitate to pick them up without a hand full of paper towels. A llama ate a Vegas drag queen and then did the porcelain salute. An owl ate a Cirque de Soleil performer and regurgitated an owl pellet. 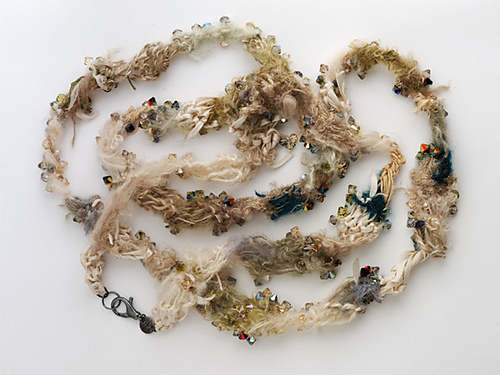 A wolfhound (owned by a fiber artist) ate a stripper and then orally extruded the results. My cat ate Elvis and then 'gifted' him to me. A kinkajou ate Ziggy Stardust and then performed a technicolor yawn. A woolly mammoth ate a Liberace impersonator and then worshiped the porcelain god. A yak ate a washed up synchronized swimmer and then yakked. A hyaena dined on Liberace with fava beans and nice Chianti, and then promptly horked him up again. A saber tooth tiger ate Raquel Welsh's fur bikini, but couldn't keep it down. A jackalope ate a stripper and then called Ralph on the big white telephone. A weasel ate an aerialist and then worshipped at the porcelain altar. I thought of you when I saw those. Hideous and expensive to make, what's not to love? My black cat "Meow" ate Charro and promptly returned her for a refund. A marmot ate Cher and then blew chunks. "A camel ate a belly dancer and then spewed." Can you tell that I've recently been to Egypt? A snow leopard ate Lady Gaga then gave a technicolor yawn. An owl ate Elvis and horked. An ox ate a Liberace and then yakked. A polar bear ate an ice dancer then barked at the ants. A ring-tailed lemur ate the cast of Dancing With the Stars and woofed them up. A bison ate Johnny Weir (the flamboyant figure skater) and ralphed. My intestinally challenged cat, Damian, ate a pole dancer, then found out he had a round-trip meal ticket. A tape worm at carnival?! 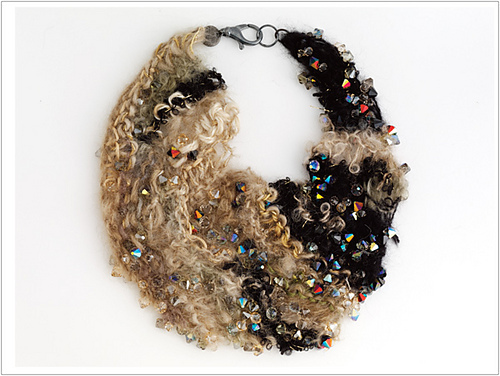 I am glad to see I am not the only one who associated these necklaces with animal vomit. Yeccch. Picture No. 1 looks to be a small dog hanging around your neck. A crazed scrapbook crafter ate a Liberace impersonater and disgorged like a bulimic after a buffet. "Caprine patient presented to ER following dietary indescretion. Owner reports damage to holiday trimmings, usually kept in attic. X-ray showed evidence of six holidays (Christmas, Valentine's, Chinese New Year (note the dragon-shaped tassel in the sigmoid), Mardi Gras, Passover and Easter). St Patrick's Day was not represented, to the stated surprise of the owner. "Patient's stomach was pumped and bowel evacuated. Contents were displayed for education purposes. "Patient recovered and expressed annoyance." ADDENDUM 3/16/10: "St Patrick's Day was not represented, to the stated surprise of the owner." Treating veterinarian stated that it was already past.